The present invention relates to a solid laundry detergent composition comprising: (a) detersive surfactant; (b) brightener in micronized particulate form, having a weight average primary particle size of from 3 to 30 micrometers; (c) from 0wt% to 10wt% zeolite builder; (d) from 0wt% to 10wt% phosphate builder; (e) optionally from 0wt% to 10wt% silicate salt; (f) optionally from 0wt% to 10wt% layered silicate; and (g) other detergent ingredients. The present invention relates to laundry detergent compositions, especially solid laundry detergent compositions that exhibit excellent water solubility and good cleaning performance, even at cold washing temperatures. Recent trends in laundry detergent powders have seen dramatic increases in product solubility, especially in cold water washing temperatures. Removal of large quantities of insoluble builders, such as zeolite, from the laundry powder have contributed significantly to this improve dissolution profile. However, there remains a need to improve the cleaning performance of these low built laundry powders. Recent focus on hardness tolerant detersive surfactant systems and optimisation of polymer systems has improved the cleaning performance. However, the recent trend in cold water washing temperatures means that there remains a need to improve the cold water cleaning and whiteness profile of the low built laundry detergent composition. The Inventors have found that the cold water cleaning profile and whiteness profile of these low built laundry powders are improved when a fluorescent brightener in a micronized particulate form is incorporated into the product. The present invention provides a solid laundry detergent composition as defined by the claims. The solid laundry composition comprises: (a) detersive surfactant; (b) brightener in micronized particulate form, having a weight average primary particle size of from 3 to 30 micrometers; (c) from 0wt% to 10wt% zeolite builder; (d) from 0wt% to 10wt% phosphate builder; (e) optionally from 0wt% to 10wt% silicate salt; (f) optionally from 0wt% to 10wt% layered silicate; and (g) other detergent ingredients. The composition can be in any solid form, typically particulate form, such as a free- flowing particulate composition, or tablet. Preferably, the composition is in free-flowing particulate form. Preferably, the composition comprises a particle, wherein the particle comprises sodium carbonate and sodium silicate. Preferably, the composition comprises a particle, wherein the particle has a weight average particle size of from 100 micrometer to 1,000 micrometers, wherein the particle comprises C.I. fluorescent brightener 260 in micronized particulate form, having a weight average primary particle size of from 3 to 30 micrometers. The composition typically has a particle size distribution such that at least 80wt%, preferably at least 90wt%, or even 95wt%, or even substantially all, of the particles have a particle size in the range of from 100 micrometers to 1,500 micrometers, preferably from 200 micrometers, or even 250 micrometers, and preferably to 1,000 micrometers, or even to 800 micrometers. The composition typically has a bulk density in the range of from 400g/l to 1 ,200g/l, preferably from 400g/l to l,000g/l, or to 800g/l. Preferably, upon dilution in de-ionised water at a concentration of lg/L at a temperature of 25 °C, the composition forms an aqueous detergent solution having a pH in the range of from 7 to 11. Preferably, the composition has a reserve alkalinity to pH 9.5 in the range of from 5 to 10. The reserve alkalinity is typically determined by the method described in more detail in test method 1. Suitable detersive surfactants include anionic detersive surfactants, non-ionic detersive surfactant, cationic detersive surfactants, zwitterionic detersive surfactants and amphoteric detersive surfactants. Preferred sulphate detersive surfactants include alkyl sulphate, preferably C8-i8 alkyl sulphate, or predominantly Ci2 alkyl sulphate. Another preferred sulphate detersive surfactant is alkyl alkoxylated sulphate, preferably alkyl ethoxylated sulphate, preferably a C8-i8 alkyl alkoxylated sulphate, preferably a C8-i8 alkyl ethoxylated sulphate, preferably the alkyl alkoxylated sulphate has an average degree of alkoxylation of from 0.5 to 20, preferably from 0.5 to 10, preferably the alkyl alkoxylated sulphate is a C8-i8 alkyl ethoxylated sulphate having an average degree of ethoxylation of from 0.5 to 10, preferably from 0.5 to 7, more preferably from 0.5 to 5 and most preferably from 0.5 to 3. Suitable non-ionic detersive surfactants are selected from the group consisting of: C$-Ci$ alkyl ethoxylates, such as, NEODOL® non-ionic surfactants from Shell; C6-Ci2 alkyl phenol alkoxylates wherein preferably the alkoxylate units are ethyleneoxy units, propyleneoxy units or a mixture thereof; Ci2-Ci8 alcohol and C6-Ci2 alkyl phenol condensates with ethylene oxide/propylene oxide block polymers such as Pluronic® from BASF; C14-C22 mid-chain branched alcohols; C14-C22 mid-chain branched alkyl alkoxylates, preferably having an average degree of alkoxylation of from 1 to 30; alkylpolysaccharides, preferably alkylpolyglycosides; polyhydroxy fatty acid amides; ether capped poly(oxyalkylated) alcohol surfactants; and mixtures thereof. Preferred non-ionic detersive surfactants include alkyl alkoxylated alcohols, preferably C$. 18 alkyl alkoxylated alcohol, preferably a C8-i8 alkyl ethoxylated alcohol, preferably the alkyl alkoxylated alcohol has an average degree of alkoxylation of from 0.5 to 50, preferably from 1 to 30, or from 1 to 20, or from 1 to 10, preferably the alkyl alkoxylated alcohol is a C8-i8 alkyl ethoxylated alcohol having an average degree of ethoxylation of from 1 to 10, preferably from 1 to 7, more preferably from 1 to 5 and most preferably from 3 to 7. The alkyl alkoxylated alcohol can be linear or branched, and substituted or un-substituted. Suitable cationic detersive surfactants include alkyl pyridinium compounds, alkyl quaternary ammonium compounds, alkyl quaternary phosphonium compounds, alkyl ternary sulphonium compounds, and mixtures thereof. (R)(Ri)(R2)(R3)N+ X wherein, R is a linear or branched, substituted or unsubstituted C6-i8 alkyl or alkenyl moiety, Ri and R2 are independently selected from methyl or ethyl moieties, R3 is a hydroxyl, hydroxymethyl or a hydroxyethyl moiety, X is an anion which provides charge neutrality, preferred anions include: halides, preferably chloride; sulphate; and sulphonate. Preferred cationic detersive surfactants are mono-C6-i8 alkyl mono-hydroxyethyl di-methyl quaternary ammonium chlorides. Highly preferred cationic detersive surfactants are mono-Cs-io alkyl mono- hydroxyethyl di-methyl quaternary ammonium chloride, mono-Cio-12 alkyl mono-hydroxyethyl di-methyl quaternary ammonium chloride and mono-Cio alkyl mono-hydroxyethyl di-methyl quaternary ammonium chloride. The brightener is in micronized particulate form, having a weight average primary particle size of from 3 to 30 micrometers, preferably from 3 micrometers to 20 micrometers, and most preferably from 3 to 10 micrometers. Preferably, the composition comprises from 0wt% to 10wt% zeolite builder, preferably the composition comprises less than 8wt%, or less than 6wt%, or even less than 4wt%, or even less than 2wt% zeolite builder. Preferably the composition is essentially free of zeolite builder. By essentially free it is typically meant herein as meaning no deliberately added. Typical zeolites include zeolite A, such as zeolite 4A, and zeolite MAP. Preferably, the composition comprises from 0wt% to 10wt% phosphate builder, preferably the composition comprises less than 8wt%, or less than 6wt%, or even less than 4wt%, or even less than 2wt% phosphate builder. Preferably the composition is essentially free of phosphate builder. By essentially free it is typically meant herein as meaning no deliberately added. A typical phosphate builder is sodium tripolyphosphate. Preferably, the composition comprises from 0wt% to 10wt% silicate salt. However, it may be preferred for the composition to comprise a silicate salt, preferably from lwt% to 20wt%, preferably from lwt% to 10wt% silicate salt. Suitable silicate salts include sodium silicate having a ratio of from 1.0 to 2.0, preferably from 1.6 to 2.0. A suitable silicate salt is sodium metasilicate. It may be preferred for the composition to optionally comprise from 0wt% to 10wt% layered silicate. Preferably, the composition is substantially free of layered silicate. By "substantially free" it is typically meant herein to mean comprises no deliberately added. Hueing dyes are formulated to deposit onto fabrics from the wash liquor so as to improve fabric whiteness perception. Preferably the hueing agent dye is blue or violet. It is preferred that the shading dye(s) have a peak absorption wavelength of from 550nm to 650nm, preferably from 570nm to 630nm. A combination of dyes which together have the visual effect on the human eye as a single dye having a peak absorption wavelength on polyester of from 550nm to 650nm, preferably from 570nm to 630nm. This may be provided for example by mixing a red and green- blue dye to yield a blue or violet shade. Dyes are coloured organic molecules which are soluble in aqueous media that contain surfactants. Dyes are described in 'Industrial Dyes', Wiley VCH 2002, K .Hunger (editor). Dyes are listed in the Color Index International published by Society of Dyers and Colourists and the American Association of Textile Chemists and Colorists. Dyes are preferably selected from the classes of basic, acid, hydrophobic, direct and polymeric dyes, and dye-conjugates. Those skilled in the art of detergent formulation are able to select suitable hueing dyes from these publications. Polymeric hueing dyes are commercially available, for example from Milliken, Spartanburg, South Carolina, USA. Preferably, the composition comprises a calcium carbonate crystal growth inhibitor selected from the group consisting of: 1 -hydroxy ethanediphosphonic acid (HEDP) and salt thereof; N,N- dicarboxymethyl-2-aminopentane-l,5-dioic acid and salt thereof; 2-phosphonobutane- 1,2,4- tricarboxylic acid and salt thereof; and any combination thereof. The composition may also comprise a chelant selected from: diethylene triamine pentaacetate, diethylene triamine penta(methyl phosphonic acid), ethylene diamine-N'N'- disuccinic acid, ethylene diamine tetraacetate, ethylene diamine tetra(methylene phosphonic acid) and hydroxyethane di(methylene phosphonic acid). A preferred chelant is ethylene diamine-N'N'-disuccinic acid (EDDS) and/or hydroxyethane diphosphonic acid (HEDP). The laundry detergent composition preferably comprises ethylene diamine-N'N'- disuccinic acid or salt thereof. Preferably the ethylene diamine-N'N'-disuccinic acid is in S,S enantiomeric form. Preferably the composition comprises 4,5-dihydroxy-m-benzenedisulfonic acid disodium salt. Preferred chelants may also be calcium carbonate crystal growth inhibitors. Preferably, the composition comprises a carboxylate polymer such as a maleate/acrylate random copolymer or polyacrylate homopolymer. Preferably the carboxylate polymer is a polyacrylate homopolymer having a molecular weight of from 4,000 to 9,000, most preferably from 6,000 Da to 9,000 Da. R1, R2, R3, R4, R5 and R6 are independently selected from H or Ci-Ci8 n- or iso-alkyl; and R7 is a linear or branched Ci-Ci8 alkyl, or a linear or branched C2-C30 alkenyl, or a cycloalkyl group with 5 to 9 carbon atoms, or a C8-C30 aryl group, or a C6-C30 arylalkyl group. Preferably, the composition comprises a cellulosic polymer, preferably selected from alkyl cellulose, alkyl alkoxyalkyl cellulose, carboxyalkyl cellulose, alkyl carboxyalkyl, more preferably selected from carboxymethyl cellulose, methyl cellulose, methyl hydroxyethyl cellulose, methyl carboxymethyl cellulose, and mixures thereof. Preferably the carboxymethyl cellulose has a degree of carboxymethyl substitution from 0.5 to 0.9 and a molecular weight from 100,000 Da to 300,000 Da. Suitable lipases include those of bacterial or fungal origin. Chemically modified or protein engineered mutants are included. Examples of useful lipases include lipases from Humicola (synonym Thermomyces), e.g., from H. lanuginosa (T. lanuginosus) as described in EP 258 068 and EP 305 216 or from H. insolens as described in WO 96/13580, a Pseudomonas lipase, e.g., from P. alcaligenes or P. pseudoalcaligenes (EP 218 272), P. cepacia (EP 331 376), P. stutzeri (GB 1,372,034), P. fluorescens, Pseudomonas sp. strain SD 705 (WO 95/06720 and WO 96/27002), P. wisconsinensis (WO 96/12012), a Bacillus lipase, e.g., from B. subtilis (Dartois et al. (1993), Biochemica et Biophysica Acta, 1131, 253-360), B. stearothermophilus (JP 64/744992) or B. pumilus (WO 91/16422). Preferably, the composition comprises a variant of Thermomyces lanuginosa lipase having >90% identity with the wild type amino acid and comprises substitution(s) at T231 and/or N233, preferably T231R and N233R. Suitable cellulases include those of bacterial or fungal origin. Chemically modified or protein engineered mutants are included. Suitable cellulases include cellulases from the genera Bacillus, Pseudomonas, Humicola, Fusarium, Thielavia, Acremonium, e.g., the fungal cellulases produced from Humicola insolens, Myceliophthora thermophila and Fusarium oxysporum disclosed in US 4,435,307, US 5,648,263, US 5,691,178, US 5,776,757 and WO 89/09259. Especially suitable cellulases are the alkaline or neutral cellulases having colour care benefits. Examples of such cellulases are cellulases described in EP 0 495 257, EP 0 531 372, WO 96/11262, WO 96/29397, WO 98/08940. Other examples are cellulase variants such as those described in WO 94/07998, EP 0 531 315, US 5,457,046, US 5,686,593, US 5,763,254, WO 95/24471, WO 98/12307 and PCT/DK98/00299. (b) optionally with one or more, preferably all of the substitutions and/or deletions in the following positions: 118, 183, 184, 195, 320 and 458, which if present preferably comprise R118K, D183*, G184*, N195F, R320K and/or R458K. Preferably, the composition comprises a choline oxidase enzyme such as the 59.1 kDa choline oxidase enzyme endogenous to Arthrobacter nicotianae, produced using the techniques disclosed in D. Ribitsch e? al., Applied Microbiology and Biotechnology, Volume 81, Number 5, pp875-886, (2009). Other suitable enzymes are peroxidases/oxidases, which include those of plant, bacterial or fungal origin. Chemically modified or protein engineered mutants are included. Examples of useful peroxidases include peroxidases from Coprinus, e.g., from C. cinereus, and variants thereof as those described in WO 93/24618, WO 95/10602, and WO 98/15257. The composition typically comprises other detergent ingredients. Suitable detergent ingredients include: transition metal catalysts; imine bleach boosters; enzymes such as amylases, carbohydrases, cellulases, laccases, lipases, bleaching enzymes such as oxidases and peroxidases, proteases, pectate lyases and mannanases; source of peroxygen such as percarbonate salts and/or perborate salts, preferred is sodium percarbonate, the source of peroxygen is preferably at least partially coated, preferably completely coated, by a coating ingredient such as a carbonate salt, a sulphate salt, a silicate salt, borosilicate, or mixtures, including mixed salts, thereof; bleach activator such as tetraacetyl ethylene diamine, oxybenzene sulphonate bleach activators such as nonanoyl oxybenzene sulphonate, caprolactam bleach activators, imide bleach activators such as N-nonanoyl-N-methyl acetamide, preformed peracids such as Ν,Ν-pthaloylamino peroxycaproic acid, nonylamido peroxyadipic acid or dibenzoyl peroxide; suds suppressing systems such as silicone based suds suppressors; brighteners; hueing agents; photobleach; fabric-softening agents such as clay, silicone and/or quaternary ammonium compounds; flocculants such as polyethylene oxide; dye transfer inhibitors such as polyvinylpyrrolidone, poly 4-vinylpyridine N-oxide and/or co-polymer of vinylpyrrolidone and vinylimidazole; fabric integrity components such as oligomers produced by the condensation of imidazole and epichlorhydrin; soil dispersants and soil anti-redeposition aids such as alkoxylated polyamines and ethoxylated ethyleneimine polymers; anti-redeposition components such as polyesters and/or terephthalate polymers, polyethylene glycol including polyethylene glycol substituted with vinyl alcohol and/or vinyl acetate pendant groups; perfumes such as perfume microcapsules, polymer assisted perfume delivery systems including Schiff base perfume/polymer complexes, starch encapsulated perfume accords; soap rings; aesthetic particles including coloured noodles and/or needles; dyes; fillers such as sodium sulphate, although it may be preferred for the composition to be substantially free of fillers; carbonate salt including sodium carbonate and/or sodium bicarbonate; silicate salt such as sodium silicate, including 1.6R and 2.0R sodium silicate, or sodium metasilicate; co-polyesters of di-carboxylic acids and diols; cellulosic polymers such as methyl cellulose, carboxymethyl cellulose, hydroxyethoxycellulose, or other alkyl or alkylalkoxy cellulose, and hydrophobically modified cellulose; carboxylic acid and/or salts thereof, including citric acid and/or sodium citrate; and any combination thereof. A highly preferred detergent ingredient is citric acid. As used herein, the term "reserve alkalinity" is a measure of the buffering capacity of the detergent composition (g/NaOH/lOOg detergent composition) determined by titrating a 1% (w/v) solution of detergent composition with hydrochloric acid to pH 9.5 at 21°C. Obtain a lOg sample accurately weighed to two decimal places, of fully formulated detergent composition. The sample should be obtained using a Pascall sampler in a dust cabinet. Add the lOg sample to a plastic beaker and add 200 ml of carbon dioxide-free deionised water. Agitate using a magnetic stirrer on a stirring plate at 150 rpm until fully dissolved and for at least 15 minutes. Transfer the contents of the beaker to a 1 litre volumetric flask and make up to 1 litre with deionised water. Mix well and take a 100 mis ± 1 ml aliquot using a 100 mis pipette immediately. Measure and record the pH and temperature of the sample using a pH meter capable of reading to +0.01pH units, with stirring, ensuring temperature is 21 °C +/- 2°C. Titrate whilst stirring with 0.2M hydrochloric acid until pH measures exactly 9.5. Note the millilitres of hydrochloric acid used. Take the average titre of three identical repeats. 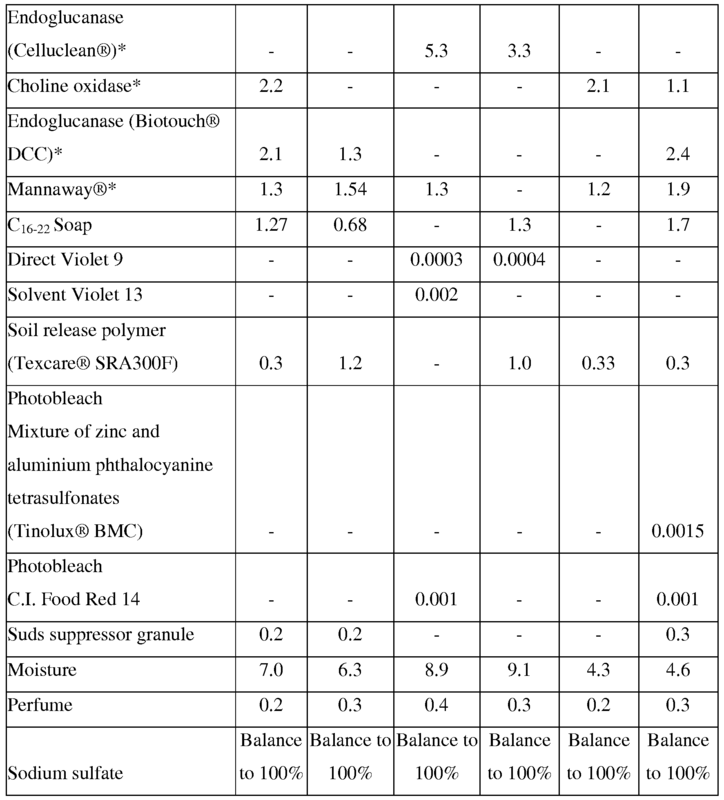 Carry out the calculation described above to calculate RA to pH 9.5. Unless otherwise indicated, materials can be obtained from Sigma- Aldrich, The Old Brickyard, Gillingham, Dorset, United Kingdom. The following compositions are made by combining the listed ingredients in the listed proportions (weight % of active material except where noted otherwise). Granular dry laundry detergent compositions designed for use in washing machines or hand washing processes. Current typical usage concentrations for these products range from 0.5g to 20g product per liter of wash water, e.g. an 80g dose for 15L wash volume. 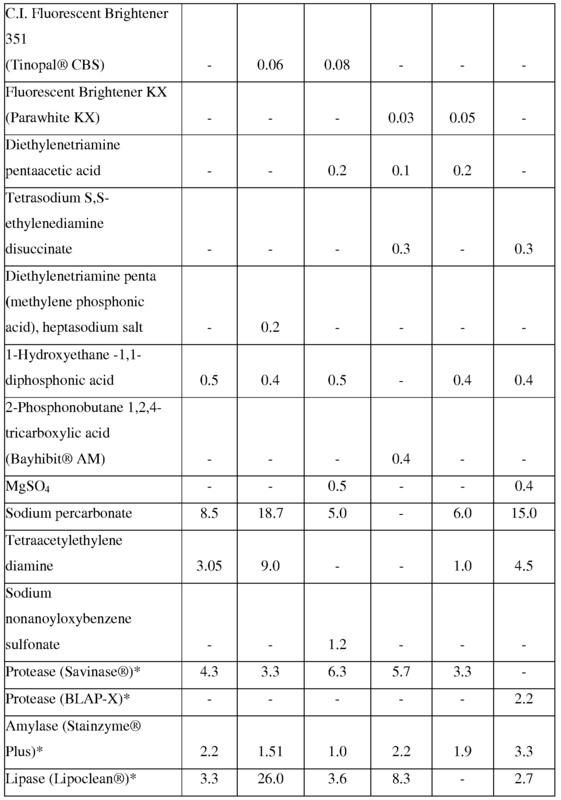 However, in the future with increasing product compaction, it would be feasible to reduce the level of sodium sulphate and/or sodium carbonate in these compositions and increase the quantities of the other constituents so as to achieve the same amounts of active ingredients in the wash at a lower dosage. Surfactant ingredients can be obtained from BASF, Ludwigshafen, Germany (Lutensol®); Shell Chemicals, London, UK; Stepan, Northfield, Illinois, USA; Huntsman, Huntsman, Salt Lake City, Utah, USA; Clariant, Sulzbach, Germany (Praepagen®). Sodium tripolyphosphate can be obtained from Rhodia, Paris, France. Zeolite can be obtained from Industrial Zeolite (UK) Ltd, Grays, Essex, UK. Citric acid and sodium citrate can be obtained from Jungbunzlauer, Basel, Switzerland. Silicate 1.6R can be obtained from Ineos Silicas, Warrington, UK. Sodium carbonate, sodium bicarbonate and sodium percarbonate can be obtained from Solvay, Brussels, Belgium. Silicate/carbonate cogranule can be obtained from Rhodia, Paris, France, as Nabion® 15. Polyacrylate, polyacrylate/maleate copolymers can be obtained from BASF, Ludwigshafen, Germany. Polyethylene glycol / vinyl acetate random graft copolymer is a polyvinyl acetate grafted polyethylene oxide copolymer having a polyethylene oxide backbone and multiple polyvinyl acetate side chains. The molecular weight of the polyethylene oxide backbone is about 6000 and the weight ratio of the polyethylene oxide to polyvinyl acetate is about 40 to 60 and no more than 1 grafting point per 50 ethylene oxide units. It can be obtained from BASF, Ludwigshafen, Germany. Carboxymethylcellulose can be obtained from CPKelco, Arnhem, The Netherlands. C.I. Fluorescent Brightener 260 particle is in micronized particulate form, having a weight average primary particle size of 6 micrometers, agglomerated into a bead with average secondary particle size of 340 micrometers. C.I. Fluorescent Brightener 351 can be obtained from Ciba Specialty Chemicals, Basel, Switzerland as Tinopal® CBS-X. Diethylenetriamine pentaacetic acid can be obtained from Dow Chemical, Midland, Michigan, USA. Tetrasodium S,S-ethylenediamine disuccinate can be obtained from Innospec, Ellesmere Port, UK. Diethylenetriamine penta (methylene phosphonic acid), heptasodium salt, can be obtained from Dow Chemical, Midland, Michigan, USA. 1- Hydroxyethane -1,1-diphosphonic acid can be obtained from Thermphos, Vlissingen-Oost, The Netherlands. 2- Phosphonobutane 1,2,4-tricarboxylic acid can be obtained from Bayer, Leverkusen, Germany as Bayhibit® AM. Tetraacetylethylene diamine can be obtained from Warwick International, Mostyn, Wales. Sodium nonanoyloxybenzene sulfonate can be obtained from Eastman, Batesville, Arkansas, USA. Enzymes Savinase®, Stainzyme® Plus, Lipoclean®, Celluclean® and Mannaway® can be obtained from Novozymes, Bagsvaerd, Denmark. Enzyme BLAP-X can be obtained from Biozym, Kundl, Austria. Enzyme Biotouch® DCC can be obtained from AB Enzymes, Darmstadt, Germany. Choline Oxidase enzyme is the 59.1 kDa choline oxidase enzyme endogenous to Arthrobacter nicotianae, produced using the techniques disclosed in D. Ribitsch e? al., Applied Microbiology and Biotechnology, Volume 81, Number 5, pp875-886, (2009). Direct Violet 9 can be obtained from Ciba Specialty Chemicals, Basel, Switzerland. Specialty Chemicals, Basel, Switzerland, as Tinolux® BMC. Suds suppressor granule can be obtained from Dow Corning, Barry, UK. The dimensions and values disclosed herein are not to be understood as being strictly limited to the exact numerical values recited. Instead, unless otherwise specified, each such dimension is intended to mean both the recited value and a functionally equivalent range surrounding that value. For example, a dimension disclosed as "40 mm" is intended to mean "about 40 mm"
3. A composition according to any preceding claim, wherein the brightener is C.I. fluorescent brightener 260 in predominantly beta-crystalline form. 6. A composition according to any preceding claim, wherein the composition comprises a hueing agent. 7. A composition according to any preceding claim, wherein the composition comprises a calcium carbonate crystal growth inhibitor selected from the group consisting of: 1- hydroxyethanediphosphonic acid and salt thereof; N,N-dicarboxymethyl-2-aminopentane-l,5- dioic acid and salt thereof; 2-phosphonobutane-l,2,4-tricarboxylic acid and salt thereof; and any combination thereof. 8. A composition according to any preceding claim, wherein the composition comprises citric acid. 9. A composition according to any preceding claim, wherein the composition comprises polyacrylate having a molecular of from 6,000 Da to 9,000 Da. 11. A composition according to any preceding claim, wherein the composition comprises a cellulosic polymer, preferably selected from alkyl cellulose, alkyl alkoxyalkyl cellulose, carboxylalkyl cellulose, alkyl carboxyalkyl, more preferably selected from carboxymethyl cellulose, methyl cellulose, methyl hydroxyethyl cellulose, methyl carboxymethyl cellulose, and mixures thereof. 12. A composition according to any preceding claim, wherein the composition comprises a variant of Thermomyces lanuginosa lipase having >90% identity with the wild type amino acid and comprising substitution(s) at T231 and/or N233. 13. A composition according to any preceding claim, wherein the composition comprises a subtilisin protease selected from BLAP, BLAP R, BLAP X or BLAP F49. 14. A composition according to any preceding claim, wherein the composition comprises a cleaning cellulase belonging to Glycosyl Hydrolase family 45 having a molecular weight of from 17kDa to 30 kDa. 16. A composition according to any preceding claim, wherein the composition comprises a particle, wherein the particle comprises sodium carbonate and sodium silicate. 17. A composition according to any preceding claim, wherein the composition comprises a particle, wherein the particle has a weight average particle size of from 100 micrometer to 1,000 micrometers, wherein the particle comprises C.I. fluorescent brightener 260 in micronized particulate form, having a weight average primary particle size of from 3 to 30 micrometers. 18. A composition according to any preceding claim, wherein upon dilution in de-ionised water at a concentration of lg/L at a temperature of 25°C, the composition forms an aqueous detergent solution having a pH in the range of from 7 to 11. 19. A composition according to any preceding claim, wherein the weight average primary particle size of the brightener is from 3 to 10 micrometers.